Available for sale is X-Factor #25 graded in 9.8 NM/M condition by CGC. Featuring the second full appearance of Archangel, this comic in high-grade condition is difficult to find. Grab your copy today while you can! The slab listed here recently sold. Click here to find another just like it! Featuring the first full appearance of the real Domino, this CGC 9.4 graded issue of X-Force #11 is perfect for any collector of graded comic books. With Deadpool 2 set to come out on May 18, 2018 where Domino will make her big screen debut, you can be demand (and prices) will rise for this comic accordingly. Grab yours today while you can! Featuring the first full appearance of the real Domino, this CGC 9.8 graded issue of X-Force #11 is perfect for any collector of graded comic books. With Deadpool 2 set to come out on June 1, 2018 where Domino will make her big screen debut, you can be demand (and prices) will rise for this comic accordingly. Grab yours today while you can! The graded comic listed here recently sold via my eBay Shop for $100. Click here to find others like it! Available for sale is X-Force #8 graded in 9.8 NM/M condition by CGC. Featuring the origin of Cable and the first appearance of Domino via flashback, this is a key modern age comic. With Deadpool 2 set to feature Cable and his right hand woman, Domino, you can expect the interest (and thus the value) in this comic to steadily increase as we get closer to the movie’s June 1, 2018 release date. The graded comic listed here recently sold via my eBay Store for $89.99 with free USPS Priority Shipping. Click here to find others like it! Featuring Spider-Man fighting alongside the X-Men, this CGC 9.8 NM/MINT issue of X-Men #10 is perfect for any collector of graded comic books. This graded J. Scott Campbell Variant of X-Men Blue #1 just arrived from CGC. Graded in 9.8 Near-Mint/Mint condition, this varaint cover of the original X-Men lineup is the perfect addition to any comic book collector. 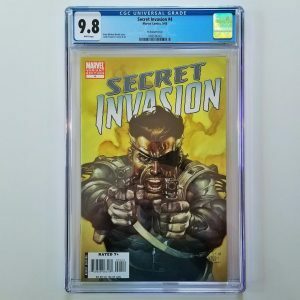 This graded comic recently sold via my eBay store for $55 shipped. Click here to find another like it! This graded J. Scott Campbell Variant of X-Men Blue #1 just arrived from CGC. Graded in 9.8 Near-Mint/Mint condition, this retro 60’s cover of the original X-Men lineup is the perfect addition to any comic book collector. This graded Pepe Larraz Young Guns Variant of X-Men Red #1 just arrived from CGC. 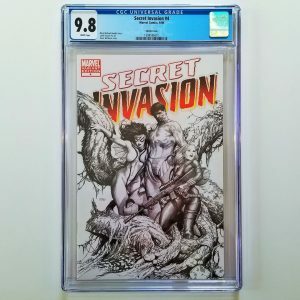 Graded in 9.8 NM/M condition, this virgin variant cover featuring Laura Kinney aka X-23 aka the All-New Wolverine is the perfect addition to your graded comic book collection. Available for sale is X-O Manowar #0 graded by CGC in 9.8 NMM condition published by Valiant Comics in 1993. 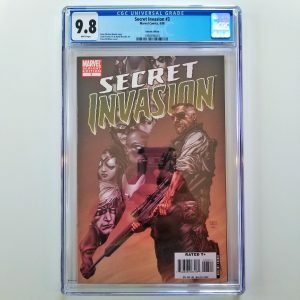 I submitted this book to CGC as the Ivory Print Logo Error, because when holding it next the same issue with the regular white logo, the comic seen in this listing clearly had a logo a few shades darker. However the folks at CGC didn’t agree, and that’s why it wasn’t given the Printing Error citation on the label. This graded issue of X-O Manowar #0 with the ivory colored Valiant logo just came back from CGC graded in near-mint/mint 9.8 condition. 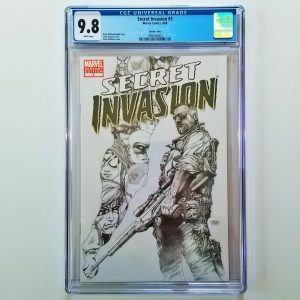 CGC considers the ivory logo (instead of the white logo) edition of this comic to be a printing error, making it slightly more collectible and valuable. 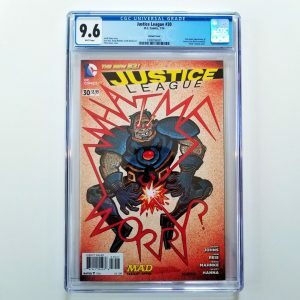 According to the CGC Census, there are only 75 total copies of this comic graded as a 9.8 making it difficult to come by in this condition, so grab yours today while you can!